We had such a pleasant time in Italy during our travel and were especially happy in Montalcino! It was such a wonderful moment . You were very kind and helpful, and yes , you're right, you're the best driver in Montalcino as you told us so! I wanted to let you know how much Merrill and I enjoyed our time with you. It was a great pleasure to get to know you and have the benefit of your expertise with Brunello wines. It has given us a more complete understanding of Tuscan wines and those from Montalicino in particular. Just a brief note to thank you once again for the time Laurie and I spent with you. You are a very important part of making our trip to Italy one that we will always remember. It is a privilege to have met you and to have spent time with you. You not only do your job as a driver and a guide in a most professional way, but you are a warm and welcoming friend. I hope that someday our paths will cross once again. I know that you will take very good care of all of Toscana until I come back. Alex, we also truly enjoyed our time with you. You are very friendly and knowledgeable and we felt very comfortable with you. It was like you were part of the family or friend and not our driver. So, thank you so much and we will talk to others about you and of course your enoteca. Best regards to Stephania and your family. Please thank you father and Stephania for shipping our extra wine. We really appreciate it! To the best driver in Tuscany. Thank you do much, Alessandro. You are an amazing driver. You have great knowledge about the surrounding areas, the good food and best wines. The best to you and your whole family. We have used Alessandro Pierangioli’s taxi service for a number of years during our visits to Montalcino. He has picked us up and delivered us near and far – Pisa, Florence, Roma and of course, Buonconvento. We dislike the renting of a car and with Alessandro we can avoid it. 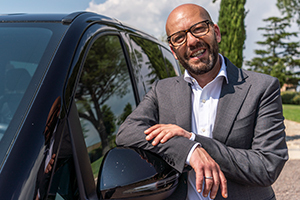 We like best that he is both professional and cautious in his driving, always on time and presents a very relax way to transit within Italy. Never while his passenger did we worry about the roads of Italy. His cars and vans are very clean and mechanically fit. When he agrees to be at a place and time he will be there. His rates are very reasonable and he offers very pleasant company during the drives. My wife and I would travel no other way than with Alessandro. If you were about to book a taxi, then let me tell you that Alessandro Pierangioli is the only way to travel! Yes, Alessandro is a driver and has a taxi service but in Italy there is a big difference between a taxi and a “autonoleggio con conducente” which means a vehicle hire with a driver and in this case you are hiring a late model vehicle well kept vehicle with your own personal driver, a chauffeur. Alessandro provides this type of exceptional service with his Mercedes limo or his Mercedes 8 seater, both extremely comfortable well kept vehicles and we’ve travelled in both. He is courteous, informative and went well beyond all we asked of him. Unlike taxi drivers we had in Rome and Florence, we found Alessandro to be one of the safest drivers we have ever travelled with in Italy over the past years and highly recommend his services to anyone visiting Italy. We had him drive us through Tuscany, Umbria, the Veneto and finally to Venice over a period of 10 days and found him totally reliable, dependable and a real find, a friend. AND price? Well no different to the local taxi prices so take my advice and get yourself Alessandro “autonoleggio con conducente” your very own driver, chauffeur, friend who also speaks such good Inglese and helped us learn more Italiano!